"Project VISIT (Vehicle Internal Systems Investigative Team) is a non profit corporation consisting of professional members, doctors, aerospace engineers and scientists as well as supporting members, such as secretaries, artists and news personnel. Houston area members of Project VISIT include, John F. Schuessler, Aerospace Engineer; Dave Kissinger, Chemical Engineer; Alan C. Holt, Astro Physicist; Granvil A. Pennington, Theoretical Physicist; Dr. Richard Niemtzow, M.D. 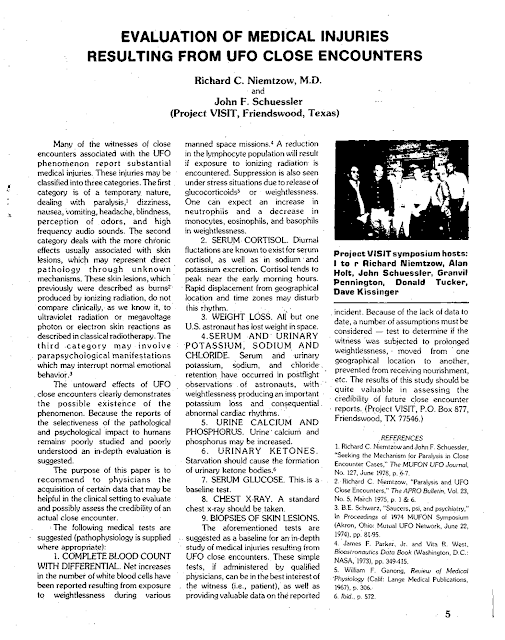 , Radiation Oncology; Richard B. Caudell, Computer Systems Analyst; Gerald Johnson, Electrical Engineer; Don R. Tucker, Graphic Communication. 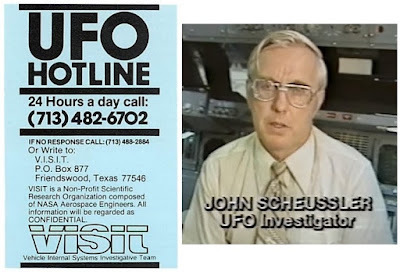 Within the field of UFO study, the national organization has focused its efforts on the scientific and engineering study of the internal systems of Unidentified Space Vehicles (USV) and of the physiology of the beings which occupy these vehicles." The group seems to have been founded on the principle that UFOs were structured craft of extraterrestrial origin, and they sought to apply their collective expertise to understanding the vehicles, their occupants, and also any physical effects produced by encountering them. Project VISIT hosted the 1980 MUFON Symposium, where Dr. Niemtzow* gave a presentation based on the article below. Project VISIT was primed to investigate an encounter of an extraterrestrial craft causing radiation injuries on witnesses, and all they needed was a fresh case to examine. On December 29, 1980, one occurred virtually in their back yard, less than 20 miles from Houston. Unfortunately, they didn't know about it. Two months later, a reporter gave one of the witnesses a phone number. That phone call began the Cash-Landrum investigation by John Schuessler and Project VISIT. * In the months between the MUFON Symposium and the beginning of the case, VISIT's resident Radiologist, Dr. Niemtzow moved away from the area and joined the Air Force as a physician. VISIT members felt he could not be trusted due to his association with the Air Force. They denied him access to case records and he was unable to participate in their investigation.